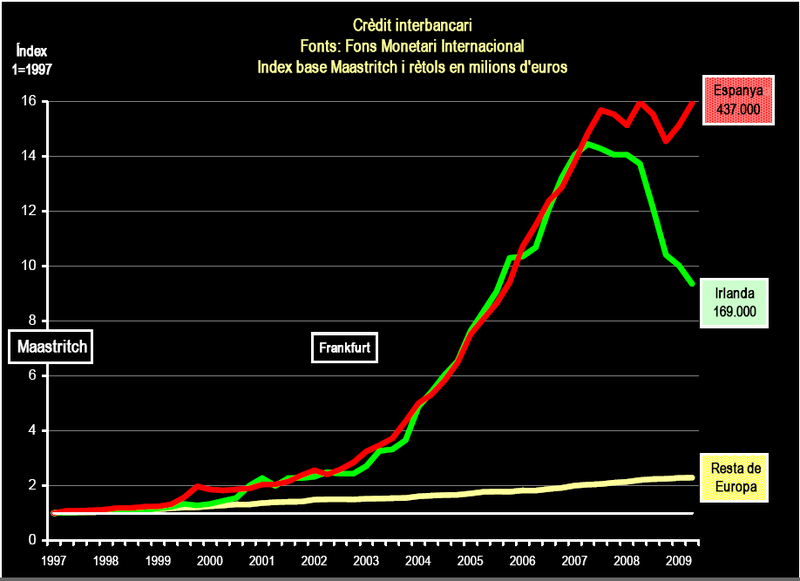 Sovereign risk and debt continues to mark the fault lines in the global macro landscape and thus the main discourse. In this context and although the technical recovery is still a reality the discourse has started to move into a decidedly bearish mood. I find this interesting since while financial markets, in traditional fashion, have reacted strongly and early on the sovereign debt crisis in Europe it is only now that we are about to close the book on H01-2010 that we are seeing significant and lingering worries from all sides that the we are headed straight into a double-dip recession. To put it differently. My call, a week ago, concerning short term belief in a technical recovery may now return to haunt me. Of course, in that specific note I did talk about divergence and I think this is really important to factor in when talking about the global economy. 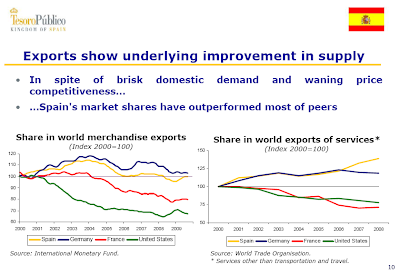 Consequently, and even in the context of developed economies alone there will sharp divergence between economies that will return to some form of growth and others who will linger in depression. Conversely, in relation to the emerging economy edifice I am largely constructive and indeed, the problem here is how to deal with the volume and volatility of yield chasing inflows as a result of super abundant liquidity provided by the G3 central banks. As I keep on emphasizing the idea of a global monetary transmission mechanism (and subsequent carry trades) and how they interact with domestic monetary policy decisions and objectives is very important to factor in to your analysis. In that respect, Morgan Stanley's Manoj Pradhan had a very good birds eye view of global monetary policy last week and specifically, the following point is a good way to conceptualize some of the costs and challenges associated with being the first to raise interest rates while G3 liquidity is provided in ample quantities. Thanks to the Great Recession and the synchronised policy response to it, central banks find themselves riding in a monetary peloton. Central banks like the Bank of Israel, the Norges Bank and the RBA that started hiking rates early (the front-riders) faced dual headwinds. First, the widening interest rate differential and abundant liquidity drove their currencies' values higher. Second, higher policy rates failed to translate into tighter financial conditions due to low bond yields and buoyant equity markets in the major economies to which most financial markets around the world remain linked. This is very close to my own viewing of the current setup in the global economy and also a setup which links in with the discourse on global imbalances. Concretely, you only need to add Pradhan's first and second point above to see how it may effectively make higher interest rates counter productive relative to the aim of cooling domestic overheating and bubbles in the making. In fact, by raising interest rates while the G3 are in QE may lead to an exacerbation of the very boom in domestic inflation/assets that the tightening bias was meant to secure against in the first place. Apart from chapter 4 of the recently published Global Financial Stability Report by the IMF (which is really a must read), a new paper from the Asian Development Bank also discusses this issue with specific focus on Asia and the distinction between floaters and non-floaters relative to the USD. Turning to the immediate economic cycle Pradhan notes the fact that hitherto hawkish central banks (e.g. Israel, Norway, and Korea) have recently backtracked on their interest rate increasing credentials. Just a few months ago, most central banks were likely deciding how soon they would have to begin their hiking process. It was too early then for most G10 central banks to start raising rates (with the notable exceptions of Norges Bank and the RBA) but markets mostly saw risks that would tempt monetary policymakers to hike sooner rather than later. That was then. Now, the risk of a spillover of euro area problems into global growth and commodity prices and a subsequent dampening of inflation expectations have shifted risks the other way. Our US and euro area teams have pushed back the first rate hikes from the Fed and the ECB to 1Q11 and 3Q11, respectively. In addition, the ECB's asset purchase programme (and, to a much lesser extent, the reinitiating of FX swap lines between the Fed and major central banks) has been a step in a direction directly opposite to an exit from QE. In other G10 economies too, central bank statements show increasing concerns about global growth and funding market stress. In its recent monetary policy report, Norway's central bank played down the expected increase in interest rates (although I expect them to resume hiking in due course), the central bank of Korea also opted to leave interest rates on hold and so did the Bank of Israel. More importantly and contrary to earlier expectations the first half of 2010 has not seen the reduction of QE wielding central banks, but actually added one to the fold in the form of the ECB biting the bullet and engaging in outright purchases of Eurozone government paper. And thus as Mr. Pradhan points out, the day when excess liquidity is going to be mopped up has been postponed yet again. If, as I expect, the Reserve Bank of Australia also opts to shelve an otherwise planned (or earlier expected) interest rate hike this Tuesday, a clear picture of monetary backpedaling is emerging. What is the moral of this fable? If you want to accumulate enduring wealth, do not lend to grasshoppers. Now, let me reciprocate Martin Wolf in his analysis by also bringing nothing new to the table in my continuing emphasis on demographics and specifically how demographics ultimately determine whether you turn up being an ant or a grasshopper or perhaps even how and why you merge from the latter into the former. My small niggle with Mr. Wolf's argument is thus the implicit assumption, as I see it, that you can actually choose to be either an ant or a grasshopper. Naturally, to some extent you can, but I would qualify the argument in a very important way. In this way, demographics and specifically an economy's median age is a good yardstick through which to determine whether it will act more as an ant or a grasshopper. In a nutshell, as the median age increase you become more and more like an ant with the subsequent desire and need to accumulate liabilities on others in order to achieve economic growth and preserve wealth. And this brings us to Wolf's final point and the alleged moral which I believe is false, indeed almost non sequitur. In this way, we need the grasshoppers just as well as we need the ants and specifically if ageing (which is a convergent global phenomenon), as I argue, leads to an increasing prevalence of ant like behavior the scare resource becomes the grasshopper who are willing and able to borrow. One of the great unsung stories of this "crisis" (at least seen from my perch) has been conditions for small business and especially credit and lending conditions. This is odd since in terms of the real economy these companies are far more important than their bigger listed brethrens; or at least as important. Consequently and while the post March-09 rally has seen many a big listed company head back to the trough in the form of issuing stock or debt (as well as the odd IPO and M&A) the conditions for small business have in many respects remained lackluster. Or have they? Well, I have not done the analysis myself and any analysis on this subject is bound to be very sensitive not only to the country in question, but indeed also the region/state and industry. This makes it inherently difficult to generalize but I still found this report by the Atlanta Fed about the credit conditions for small businesses in Alabama, Florida, Georgia, Louisiana, Mississippi and Tennessee (using a survey sample of 311 companies) an interesting read. What I especially like was really the introduction in which Paula Tkac (assistant vice president and senior economist at the Atlanta Fed) touches on the very important issue of disentangling supply and demand drivers in the context of assessing the impact of "tighter" credit conditions. In this sense, deleveraging which has now become one of the main underlying structural forces that drive real economic activity essentially may be propelled by both demand and supply factors. On the demand side, simple changes in preference may lead to a lower demand for debt or more precisely, the correct discounting, by the individual or the company, of her economic situation may lead to less demand for debt. In addition (and very relevant for the analysis by the Atlanta Fed) demand may go down because some would-be borrowers are "discouraged" from applying for credit as they anticipate a negative outcome of their application. On the supply side and beyond the obvious effect of raising price/the interest rate (in a wide discretionary move) credit may simply not be available in the same quantities or some economic agents may be precluded entirely from having access to credit. 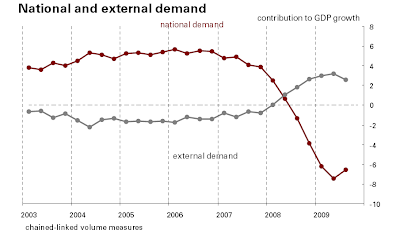 In many ways, the idea that demand side factors are just as prevalent in the process of deleveraging as are supply side conditions is an important entry point to understand the real economic dynamics from the crisis on, in this case, the US economy. In this sense and if you will allow me to briefly expand the perspective it means that there is no switch that can be turned on which will bring us back to normal once funding conditions in the bank sector returns to normal. 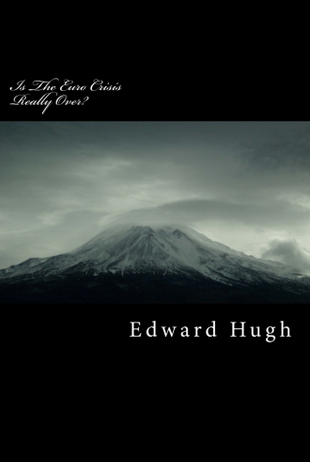 Indeed, during the initial phases of the crisis in which the seizure of the wholesale money market was the talk of the town a widespread assumption emerged, almost by definition, that once central banks had restored confidence the supply of credit/funding could return to normal and we could be back on our merry way. We know now of course that this was not the case and while the huge back draft of turd assets and the concrete need to rebuild balance sheets still acts as an important supply side constraint I take the Atlanta Fed's analysis as a small and local evidence for the notion that a more profound structural change has taken place. Well, I may be taken it too far of course and I certainly would not want to make Altig et al. at the Atlanta Fed straw (wo)men for my musings, but I still hold this to be significant. The report by Paula Tkac is worth reading in its entirety as it also goes into the obvious point that the impact on small business credit conditions from the crisis is strongly industry biased (basically, construction and real estate companies face much tougher credit conditions). German Finance Minister Wolfgang Schaeuble told reporters in Brussels yesterday (Monday) that getting their deficits down was "the only task that everyone has to fulfill for himself and for the common good." Meanwhile, over in New York, Paul Krugman was busy writing on his blog that "the most startling and frustrating thing about the debate over the fate of the euro is the way almost everyone avoids confronting the core issue" - which is, according to Krugman, that "wages in Greece/Spain/Portugal/Latvia/Estonia etc. need to fall something like 20-30 percent relative to wages in Germany". So at one extreme the Eurozone's problems are seen as being almost exclusively fiscal ones, while at the other the principal problem is thought to be one of restoring lost competitiveness. The difference in perceptions couldn't be clearer at this point, now could it? And if all of this is causing so much confusion among reasonably well informed economic observers, then what chance is the layperson likely to have? As it happens, reading through this piece by PIMCO's Mohamed El-Erian this morning a number of thoughts started to come together in my head. Essentially what we have on our hands are a number of distinct (yet inter-related) problems, but few studies seem to go to the trouble to differentiate these analytically, and the end result is often a hotch-potch, which given the seriousness of the European situation is an outcome which is a long long way from being satisfactory. One point that is often not stressed hard enough and long enough is that the backdrop to this whole debt issue is the underlying problem of rapidly rising elderly-dependency ratios (and increasing population median ages) across the entire developed-economy world. Normally this implies the imminent arrival of a wave of heavily underaccounted-for-liabilities which will simply increase the pressure on the underlying structural (rather than cyclical) deficits in the worst affected economies. The strange thing is that this development had in principle been long foreseen, and indeed formed part of the underlying raison d'être for drawing the 3% deficit/60% debt Maastricht line-in-the-sand. The other part was, of course, an attempt to stop spendthrift governments being spendthrift. As is now abundantly clear, in neither case can the Maastricht package be said to have worked, but the unfortunate historical accident is that we have come to realise this in the midst of the worst global economic crisis in over half a century (indeed arguably the second worst one ever, and - disturbingly - it is still far from being over). So one part of the sovereign debt concerns which are currently so preoccupying the financial markets is associated with the containability of state debt in the context of ageing societies, and this issue is further complicated by the fact that different developed societies are ageing at different rates. This underlying uneveness is leading some people to draw some surprising conclusions. For example, according to a Financial Times/Harris opinion poll published this morning, the French turn out to be the most nervous of developed economy citizens when it comes to thinking about the sustainability of their country’s public finances. Some 53 per cent of those polled in France thought it was likely that their government would be unable to meet its financial commitments within 10 years, while only 27 per cent thought this outcome was unlikely. Americans were only slightly less worried, with 46 per cent saying default was likely, against 33 per cent who saw it as unlikely. Curiously, only a third of the British people polled thought a government default was likely in the next 10 years, and I say curiously since on many counts the UK economic position is far more critical than the French one is. In fact, I am inclined to think that the British here are being reasonably realistic, while the French and the Americans are not, and I say this for one simple reason: all these countries have had substantial immigration in recent years, while the fertility levels in each case are quite near population replacement level. And this means that their population pyramids are much more stable, and if what is worrying you is rising elderly dependency ratios, then this is important. Let's put it this way, if you assume (a big assumption I know) that underlying GDP growth rates are similar, and that the level of pension entitlement is the same, then the more rapidly the elderly dependency ratio rises the greater the pressure on deficits and accumulated debt. 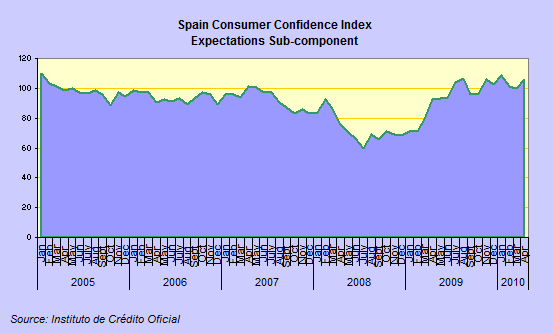 On the other hand, the Spanish respondents were remarkably more positive about their situation, with only about 35 per cent of Spaniards questioned saying they considered default to be a likely eventuality over the next decade. Which is strange, not because I have any special insight into whether or not Spain will default, but Spain's problems are clearly worse than any of the other three aforementioned countries (in part, as Krugman stresses because they lack some key economic policy tools which could help them correct the distortions in their economy) and, even more to the point, Spain's citizens are showing very little appetite at this point for making the changes which will be needed to stave off the worst case scenario. Without reform in the labour market, and in the health and pension systems, France's finances are just as capable as going careering off a cliff as anyone else's, but the French do have a little more time, and this, at the end of the day, could be critical. Also the French (like the Swedes) have done their homework in one department - the demographic one - so their population pyramid is inherently much more stable than the Spanish one. Indeed the Spanish government clearly indicated last week just how little they understand the importance of this question, since rather than facing up to the wrath of the Spanish pensioners (who of course vote) by cutting back on pension payments, they took the easy route (since babies don't vote, and those who never get to be born even less so) and slashed the so called "baby cheque" (which may well not be the best of pro natality policy tools, but still). Basically cutting the baby cheque instead of cutting back on pensions has to be the next best thing to slitting your own throat, just to see what happens. Societies need to invest in their future, not in their past, and having children is an investment, indeed in the age of the predominance of human capital it is one of the most important ones there is. Basically this whole area (of the impact of ageing populations on GDP growth performance and with this the consequent debt dynamics) remains largely underexplored by most mainstream analysts, but for now I will simply state that those "doctors" who wish to offer cures for our collective ills yet fail to mention the underlying dynamics of the demographic transition all our societies are passing through (even in a footnote) have missed one very important dimension of the overall picture, and their analyses and remedies are likely to be correspondingly deficient as a result. The musings of Mohamed El-Erian, interesting as they are, would fall into this category, since I fear he is missing the biggest part of the big picture. 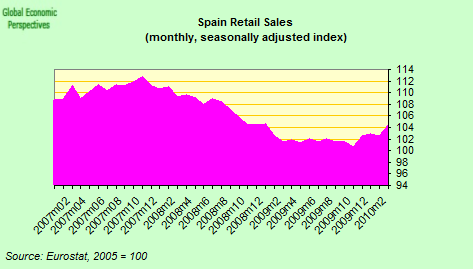 Secondly, there is the issue of the financial rescue which has been carried out during the crisis itself. 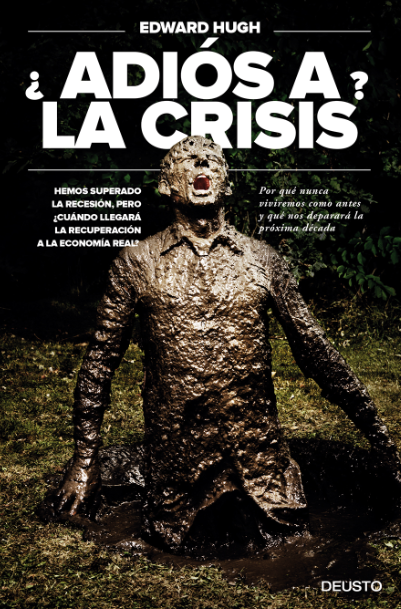 Something strange seems to have happened to the discourse over the last three years, since a problem which originated in the financial sector has now metamorphised into a fiscal crisis for almost all modern democratic states. Indeed, such is the sense of panic being generated out there on this issue that I am already starting to see articles from investor circles asking whether or not democracy is compatible with fiscal rectitude. This is rather putting the cart before the horse, I feel. So having identified an underlying structural issue with government spending in the previous (demographic) argument, we should not fail to notice the fact that another significant part of rising state indebtedness comes from having recently bailed out a significant chunk of the private sector. Look at Latvia for example, and the Parex bank bailout, as the extreme case, since government debt to GDP was something like 12% before the crisis, while it is now heading up to near 80%, or Ireland, where debt was around 35% of GDP before the crisis but will probably rise above 70% this year. In fact, a rather weird circle has been created. The private sector (possibly as a result of the absence of adequate public vigilance) got itself into a huge mess of its own making. Governments all over the globe (understandably and correctly) rushed in to put the fire out, and in the process transferred the problem over to their own balance sheets. 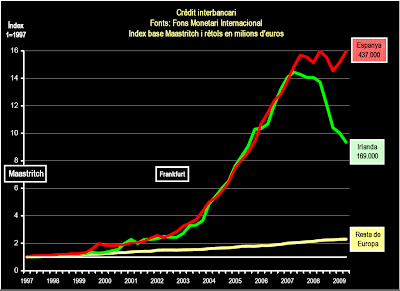 But what is most interesting to note about what happened next is how, given that the crisis itself means there are few positive investment outlets in the first world, the money generated by the bailouts is increasingly being used to encircle those very governments who initially made them. Basically a massive moral hazard conundrum has been created, as markets leverage a discourse which pressures governments for fiscal rectitude (which is contractionary - given the depth of the crisis - as far as aggregate demand is concerned), in the process creating the need for yet more bailouts, and so on (the possibility of ultimate Greek default being perhaps the clearest example here). Actually, while the initial "fire prevention" intervention was evidently necessary, people may have been mislead into thinking that action, in and of itself, would do the trick (see Bernanke's speech on Milton Friedman's 90th birthday - with its this time we got it right theme - also see note at the foot of this post) due to a slightly faulty diagnosis of what happened during the great crash. There was, of course, a bank run: but this was by no means the whole picture, and in any event doesn't explain why the whole global economic system took so long to recover, even back then in the 1930s. So something decisive needs to be done to break the circle which currently binds us, although at this point I am not exactly sure what. If we could agree that Mohamed El-Erian's most striking insight is that: "Industrial countries are running out of balance sheets that can be levered safely in order to minimize the disruptive impact of past excesses. ... The balance sheets that are left -which reside essentially in central banks - are not made (and, I would argue, should not be forced) to assume permanent ownership of dubious assets." then the logic would seem to be that the dubious assets need to be put back where they belong - on the balance sheets of the private sector in general (including households) and the likes of AIG, Goldman Sachs, UBS, and naturally PIMCO. But we should be clear: any such move to do this would also be significantly growth "unfriendly" across the first world. And thirdly, and certainly not least importantly, as Paul Krugman is constantly pointing out, here in Europe we have an additional complicating factor: the euro experiment. Whatever the pros and cons of all the various arguments here, one thing seems evident: under the existing set-up the 16 economies are not converging. Exactly why this is would take us into areas which lie far beyond the objectives of this short post, but I would say that, personally, I feel the different demographic trajectories of the countries concerned must form part of the picture. 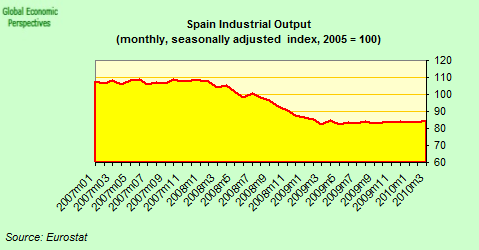 As Angela Merkel is stressing, even in the best of cases (the euro holds) the bailouts which are being prepared can only buy time in which to carry out the much needed adjustments, which in countries like Spain/Portugal/Ireland are as much to do with restoring competitiveness to an extremely distorted private sector as they are to do with applying fiscal correction measures. As far as I can see, measures like collectively financing state debt via EU bonds and bilateral loans - plus operating some variant of Quantitative Easing at the ECB (if this can all credibly be made to stick, and the vicious circle meltdown mentioned in the second point be avoided) - could temporarily stabilise the patient while the much needed surgical intervention is carried out. But my guess is that one by-product of doing things this way would be that a lot of the toxic stuff would then work its way onto the ECB balance sheet. Thus, instead of recapitalising Spanish Cajas, what we would then be collectively into would be recapitalising the central bank, which would be just another form of fiscal sharing through the back door (with the result that, following a good Brussels tradition, what you can't explain to people directly and from centre stage, you explain to them in footnotes and in the small print). The latest data from the ECB (see this useful post from FT Alphaville), suggest that the bank is not only busy buying peripheral bonds, it is also buying private paper from countries like Spain and Portugal (although there is no breakdown available on this point). The measures which need to be applied on Europe's periphery are all more or less obvious at the micro level - labour market reform, pension reform, reform of the public administration - but (and assuming we have at most three years to see all this though before the respective populations get very, very restless), on the macro economic side it is very doubtful such measures will have the impact which is expected for them in terms of restoring competitiveness and growth, and fiscal order can only be restored by restoring competitiveness and growth. a) Either the peripheral economies undertake a sizeable internal devaluation (say 20%, but this is just a rule of thumb estimate). The snag here is that at the present time most EU policymakers remain unconvinced that we need a shift of this magnitude. Yet there is surprisingly little detailed study of how the economies concerned are going to get back to growth without this price correction. Indeed the EU Commission itself has strongly pointed out that the rates of domestic private consumption growth being assumed for these economies by the respective national governments in their Stability Programme estimates are highly optimistic. 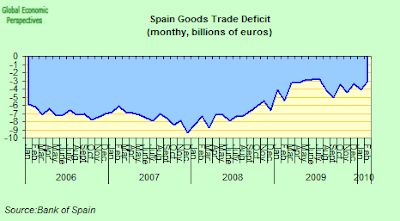 What would be nice would be for someone to set up a small model to try to examine just how much ongoing growth in the combined goods and services trade surplus countries like Spain now need to achieve to get positive growth in headline GDP under a variety of different assumptions, including low or negative inflation, stagnant domestic consumption and reduced fiscal spending. 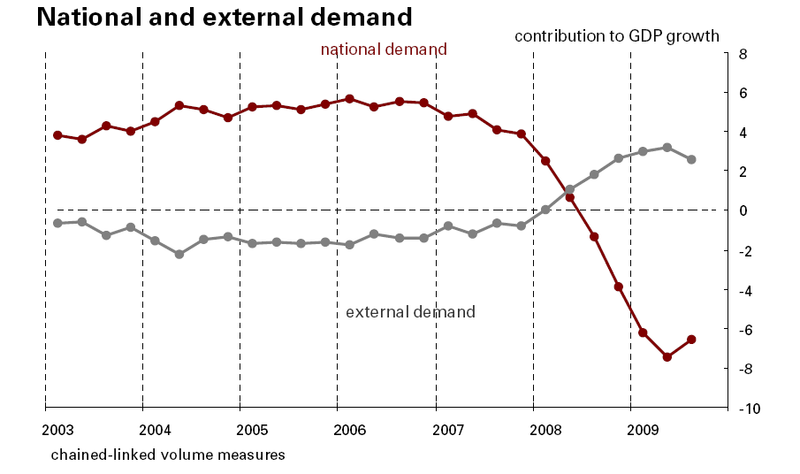 b) Germany (and possibly one or two other smaller economies) temporarily leaves the eurozone and revalues. Now, since option (a) looks very, very difficult to implement (especially since virtually no one apart from people like me and Krugman apparently wants to even hear of it),to which problem we could add the fact that German politicians are having increasing difficulties convincing their citizens that the "qualitative transformation" of the ECB is what is really in their best interests, then on a purely pragmatic level (b) may well end up being what happens in the end (and we had better just hope any eventual German exit is only temporary). Having Germany temporarily separate from the Eurozone would, in fact, have a number of evident advantages. The first of these would be that citizens in the South would not need to see their wages slashed, while those in Germany would not be asked to pay for bailouts via their tax bill, or lead to blame Greeks or Spaniards for having their hospitals closed or their pensions reduced: ie it would all be politically much easier to handle at this point. Evidentally German banks would have to swallow a write-down, as loans paid back in Euros would not be worth the same in (new)marks, but 70% of something (say) is better than zero or 20%, and the big plus would be that as the Euro devalued sharply the peripheral economies could rapidly return to growth, and government finances could be quickly turned round as exports grew, tourists returned, and (in addition) many of those coastal properties that currently stand empty could be sold. At the end of the day, what would be left would be a private sector, and not a public sector, problem, and it was (in part) the private sector who got us all into this mess (wasn't it?). Indeed this solution does to some extent coincide with what could be termed the new economic reality, since economic growth in emerging markets mean that these are fast becoming key trading targets for German industry, as consumption in Southern and Eastern Europe looks to be increasingly "maxed out". In fact, according to the recent March trade report from the German Federal Statistics Office, the rate of interannual growth in exports to ex-EU "third" countries (34.7%, as compared with 15.1% for the euro area) was significant, while the volume of trade (34.2 billion euros as opposed to 35.2 billion euros for the Euro Area) is roughly comparable, and indeed at this rate countries outside the EU will soon replace the Eurozone group as destinations for German exports. I say I hope this move (if undertaken) would be temporary, since I think in the mid term the German economy is neither so strong, nor the peripheral countries so weak, as many commentators assume. But being out of the zone would give the Germans the opportunity to see this for themselves. The important point to emphasise, I feel, is what we now need is an orderly and credible solution to our problems. Simply standing back and watching things deteriorate, and keeping our fingers crossed that what won't work will, is not going to produce an orderly outcome. Au contraire! Even those precious exports we are winning as a result of the falling Euro are being put in doubt, try these headlines from Bloomberg: Mexico’s Peso Falls Third Day on European Fiscal Deficits, Yuan Appreciation Unlikely This Year Due to Europe Debt Crisis, Emerging-Market Stocks Drop Most in Six Days, Russian Stocks Slide Most in Week on Oil, Europe Debt Concern. And this is just a quick selection. 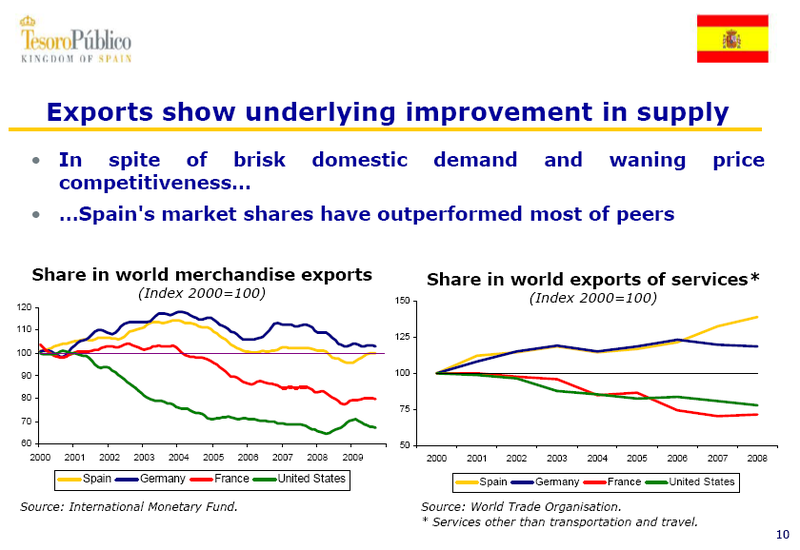 The problem is that any gain to exports outside the EU can be offset by falling risk sentiment as the currency slide continues, and markets which were previously being funded lose the ability to attract money. What we need are some serious measures which can turn the tide, and restore confidence that we are applying measures which will work. Or as Krugman puts it: "If the euro isn’t workable without highly flexible nominal wages, well, it isn’t workable". It's a sad conclusion, but that would seem to be where we are at this point. Basically, it is obvious that any road forward is now fraught with difficulty, but a situation where none other than the head of Deutsche Bank is saying that in all probability Greece will not be able to pay, and where an ECB which badly needs to operate a policy of Quantitative Easing but is at desperate pains to try to show that it isn't, is evidently not sustainable for long. Money has been put on offer, and the financial markets are now chafing at the bit to try to force it up and onto the table as quickly as possible. July promises to be another sweltering month here in Spain. Maybe it's time for a rethink. Note: At the end of his "On Milton Friedman's Ninetieth Birthday" speech Ben Bernanke arrived at what now looks like a rather hasty conclusion: - "Let me end my talk by abusing slightly my status as an official representative of the Federal Reserve. I would like to say to Milton and Anna: Regarding the Great Depression. You're right, we did it. We're very sorry. But thanks to you, we won't do it again". 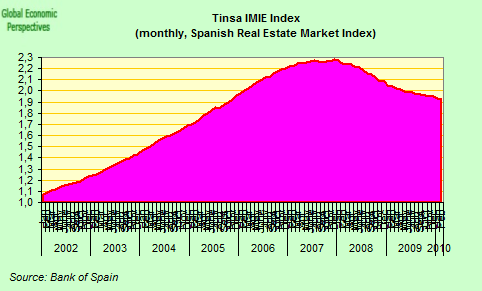 In fact, what is at issue here is a question of causality, whether the real economy problems are ultimately caused by the absence of a "stable monetary background", or whether in fact, the demand shock unleashed by the unwinding of a highly leveraged economic boom may not be the main factor in preventing the recovery of a "stable monetary background", as we have already seen in the Japanese case. The critical question facing all developed economies in addressing their fiscal sustainability problems is where the aggregate demand is going to come from to make the adjustment both viable and socially palatable. Presidents and Prime Ministers have to be careful with their choice of words. Especially in times of crisis and difficulty for their country. Former Mexican President José López Portillo will be remembered by history, not for his turbulent relations with his beautiful mistress Sasha Montenegro, but for the fact that one day after he appeared on national television stating "I will defend the Peso like a dog after its bone" the Peso was massively devalued. In similar fashion, when the Greek Prime Minister declares "Our national red line is to avoid bankruptcy," the markets do not know how to interpret him. 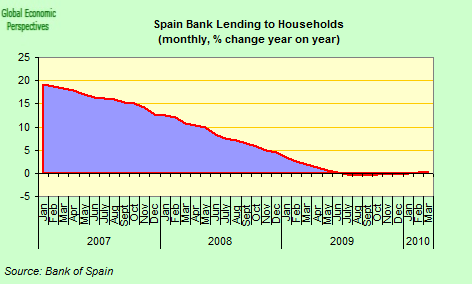 Does this mean, they ask, the some form of debt restructuring is imminent? 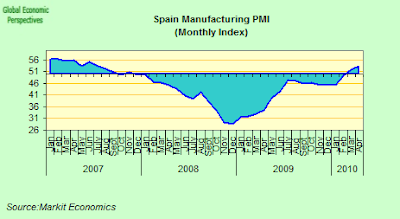 So the intervention this week of Spain's Prime Minister Jose Luis Rodriguez Zapatero, in a rather clumsy attempt to calm financial markets, could not have been more unfortunate. 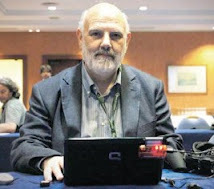 It is “absolute madness.” he told journalists in Brussels, to think Spain will need the kind of aid package debt-laden Greece is receiving from the European Union and the International Monetary Fund. Of course it is, at least at this point in time. So why mention such a possibility? 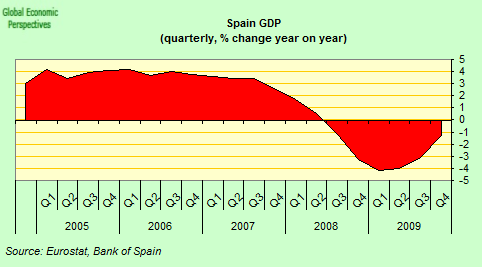 Right now what Spain needs is determination, leadership and serious reform. 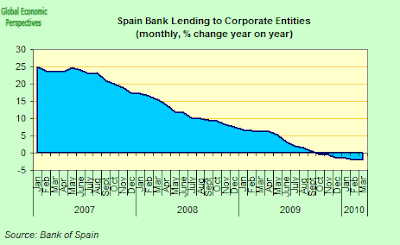 Mr Zapatero was reacting to market rumours that Spain was next in line for a rescue loan and was in the process of negotiating a €280bn bail-out package. The International Monetary Fund in Washington, for their part, confirmed that they will indeed be visiting Spain next week, but clarified that this simply formed part of a rountine annual consultation. There was no question of any rescue plan, and there the matter should have rested. But something, somewhere had touched a raw nerve in the Spanish administration. Mr Zapatero said it was “simply intolerable” that such rumours were damaging Spain’s interests and could increase the cost to the state of raising money through bond issues. But his statement did little to improve things, since the country had to pay an average yield of 3.53 per cent on the sale of €2.35bn of five-year bonds later in the week. 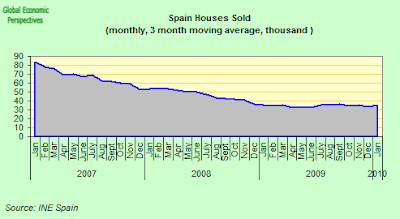 This was 72 basis points more than at the last five-year bond auction only a month ago, and the highest yield for the sale of new Spanish bonds over this maturity since May 2008. To put this in perspective, if matters continue in this way, the additional revenue anticipated from July’s VAT increase will soon be eaten up in added interest payments. 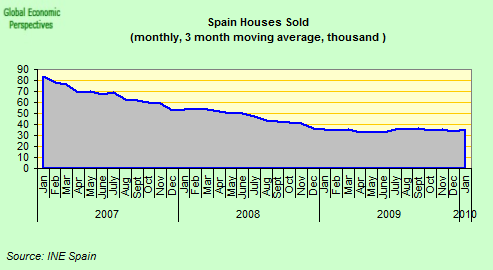 The root of the problem here does not lie in rumours, or inadequate perceptions of Spain’s situation among investors or “speculators”. The real problem is to be found in the levels of debt, whether public and private, which are to be found in many countries on Europe’s periphery, and in the ability of Europe’s existing institutions to handle the problems which have arisen. And all of these concerns made themselves evident again on Friday, since despite the fact that many Eurozone countries have been busy getting parliamentary approval for the loans to Greece, the markets remain unconvinced that the rescue will work. Greek government bond prices fell sharply on Friday amid investor flight due to concerns the country might be forced to restructure its bonds in the coming days and weeks because of the deterioration in sentiment that was only made worse by the sharp fall in US stocks on Thursday. As the Greek emergency has grown into a wider European sovereign debt crisis, so eurozone governments seem to have arrived at the conclusion that changes to the design of European monetary union can no longer be postponed, and this topic will surely be the main item at their Brussels meeting this Friday evening. Details of the kind of changes which may be under consideration remain scant, and it is still far from clear that Europe's leaders are ready to accept just how thoroughgoing the institutional changes may need to be if they are to be capable of putting the common currency on a sound and sustainable footing. Greek 10-year bond yields rose to a record 12.287 per cent on Friday, while the cost to insure the country’s bonds against default rose close to 1,000 points, a level widely considered to be an indicator that a country or institution is in danger of default. Portuguese 10-year bond yields also rose to 6.18 per cent, another record, while the cost of protect Portuguese debt jumped to over 500 points. 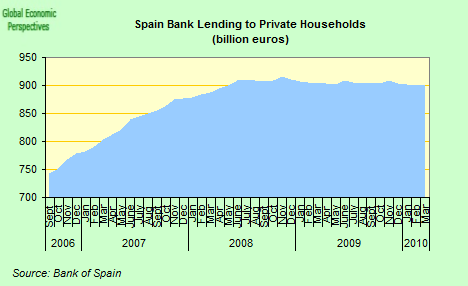 This situation is already causing all sorts of anomalies, with Portugal, for example, facing the problem of having to lend Greece emergency loans at rates (5%) which are lower than what it would have to pay to borrow the money in the capital markets itself. So confused was the situation on Friday afternoon that even the European Central Bank found itself repeatedly pressed on rumors that it was considering a special credit line for European banks. The focus of attention was a suggestion that the ECB might announce a special 12-month loan facility amounting to as much as EUR 600 billion over the weekend. This speculation followed strong market disappointment that no clear strategy had emerged from the monthly meeting of the central bank on Thursday. The news that three-month U.S. dollar Libor rates jumped 0.05 percentage point to 0.428% on the day simply added to concerns, since it suggests that demand for dollars in the European banking system is on the rise. The report comes amid growing concerns that European banks face another liquidity crisis due to the widening sovereign debt crisis. Tension may well come to a head in July after the ECB's 12-month money tender expires, when banks will be expected to return to the interbank market for funding. But in what is begining to look horribly like a repitition of what happened in the autumn of 2008 Europe's wholesale money market is starting to show signs of increasing stress, relieved only by the fact that European Central Bank is still offering unlimited liquidity to the system, if only for one week at a time. One small datapoint attracted a lot of attention among market participants on Wednesday: the 2 year German bund spreads was trading below the 3 month euribor. The last time that happened was right before Lehman Brothers went down in October 2008. No wonder everyone was so jittery on Thursday when someone made a trading error. 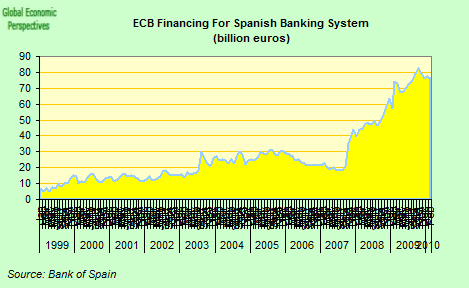 And use of the ECB deposit facility to store cash has been rising. It rose to 290.01 billion euros on Thursday, up from 1.99 billion euros on Wednesday, according to ECB data, offering us an indication of the extent to which banks prefer to bolt-hole their money over at the ECB rather than lend to each other. So the real confidence issue at the moment does in fact revolve around Spain. But not around Spain’s public debt, which is still small by European standards. 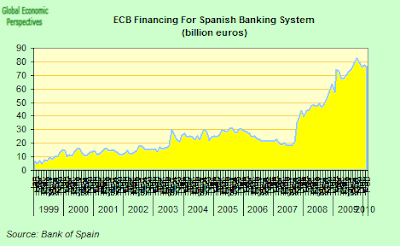 Rather the crisis of confidence turns on whether or not Spain’s banking system will be able to find sufficient funding in the interbank market to satisfy its liquidity needs according to the exit schedule (still formally in place) laid down initially by the ECB. In Spain itself the problem is that with the country’s’ leaders constantly denying there is a public debt problem while avoiding addressing the private debt issue, there is a real danger that confidence deteriorates even further, especially given the large quantity of public and private debt due for renewal in July. 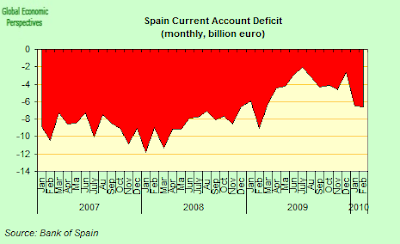 “We can’t spend all day paying attention to speculation,” Mr Zapatero said in Brussels. Exactly. Then don’t do it. What Spain’s Prime Minister needs to learn to do is stop answering questions people aren’t asking. As for Europe’s leaders, the time for talking and the time for waiting is now over. What Europe needs is action. Action to convince the markets that they have the policies and they have the will to make the institutional changes that are needed to make the common currency work effectively. Since if they don’t, or if they can’t, then like President José López Portillo before them they may find the dog that can only bark and never bite very rapidly loses possesion of his bone. According to a once famous statement by the British Prime Minister Harold Wilson, a week is often a long time in politics. But when it comes to financial market crises we seem to follow a pattern more reminiscent of a line from the Dinah Washington version of an old María Méndez Grever song: "What a difference a day made". 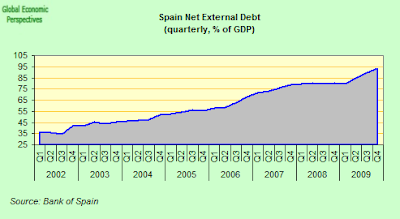 The day in this case was last Wednesday, at least for those of us here in Spain, since it was on Wednesday that the ratings agency Standard & Poor's downgraded Spanish Sovereign debt to AA from AA+. As a result the cost of insuring such debt using credit default swaps (CDS) surged at one point to a record 211 basis points according to CMA DataVision prices. Contracts on Greece and Portugal also rose sharply, with Greece climbing 42 basis points to hit 865.5, while Portugal jumped 20 to 406. 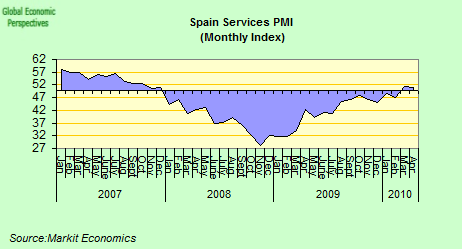 Standard & Poor's justified their Spain downward revision by referring to their medium-term macroeconomic projections. In particular the agency cited heavy private sector indebtedness (of around 178% of GDP), an inflexible labor market (they expect unemployment to remain around 21% throughout 2010, but then continue at a very high level for half a decade or so), the country's fairly low export capacity (Spain's exports only amount to around 25% of GDP) and the general lack of external price competitiveness. 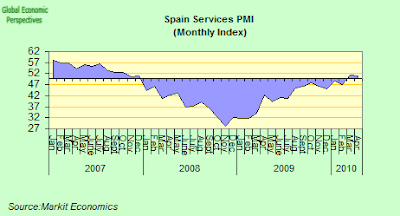 All these factors they feel are likely to mean that Spain will have low growth between at least now and 2016, a factor which will make the combined burden of private and public indebtedness much harder to service. And despite the fact that Spanish Deputy Finance Minister Jose Manuel Campa stepped forward to say he was “surprised” by the move, arguing they are based on overly pessimistic growth forecasts, the fact is it is very hard to disagree with the S&P conclusions, as investors across the globe well understand. Even the EU Commission recently responded to Spain’s Stability Programme by stating that the growth forecast it contained was far too optimistic, and the IMF are even more pessimistic than the Commission. Now even if one does not entirely go along with the whole analysis they offer of the roots and remedies for Spain's malaise, there can be no doubt that they now take the situation very seriously, even if one could lament that they did not begin to do so starting in August 2007, when the wholesale money markets first closed their doors to the increasingly toxic products that were being issued from within the Spanish banking system. The warning signs were already there, and were plain to see, although, unfortunately few inside Spain were able to do so. As a result, nearly three critical years have been lost, dithering around, large quantities of public money have been wasted, and what was a private sector external indebtedness problem has now been transformed, little by little, into a fiscal crisis of the state. 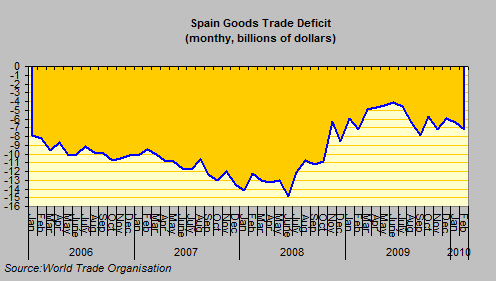 If the Spanish economy is really to be put straight, and not simply go straigh back and recidivise (after whoever it is who will do the "bailing out" finally does it), then surely one major priority during the coming national soul-searching process must be for public opinion leaders to find the ability and the courage to speak openly and clearly about the Spanish economy's "inner secrets", and the strength of character needed to publicly recognise problems in order to be seen to address them in a proactive and not a reactive fashion - to be out there in front of the curve, and not constantly trailing behind it. 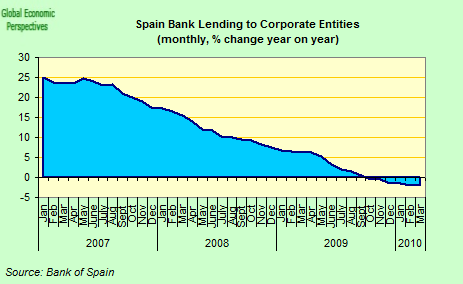 Put another way, it's high time Spain's bank and financial analyst community finally came out of the closet. And if that all important international investor confidence is to be once more regained then it is important that those in the Economy Ministry are seen to be aware of the problems they face, and not simply reduced to the role of "marketing department" for a government which finds itself in ever deeper difficulty, caught between the rock of its own voters, and the hard place of the international financial markets. If you don't like having rating agency downgrades, then do something to avoid them before they inevitably come. 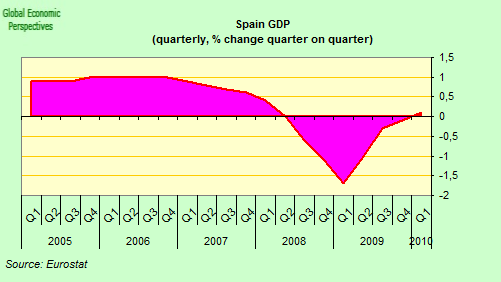 But what was it Mr Zapatero was saying only yesterday, oh yes, he personally can see "signs" the Spain's economy Spain is at long last "improving", that the "worst is now behind us", or as Miguel-Anxo Murado so ironically puts it in the Guardian's Comment Is Free: "all repeat after me, "Spain is not Greece"". I'm not sure who it is the Spanish Prime Minister currently has interpreting the signs for him - it is certainly not Perdro Solbes, or David Vergara, or Jordi Sevilla, or indeed Carlos Solchaga - but it seems far more likely to me to be one of Spain's renowned Gypsy palm-readers than any reputable and internationally recognised macro economist. In fact, as I have often stressed (and as Paul Krugman makes plain yet again here) Spain's problem is not essentially a fiscal one. Spain's problem is one of very high levels of corporate and household debt, and how Spain's banking system is going to support these during the long economic downturn and the ultra-high unemployment the country now faces, especially as a growing number of unemployed steadily lose their entitlement to unemployment benefit. The problem is not only that unemployment is currently running at 20%, but that benefits only last two years (plus an emergency six month flat rate 426 euro monthly payment extension), while many forecasts are now showing unemployment in the 16% to 20% range in 2013 or 2014. 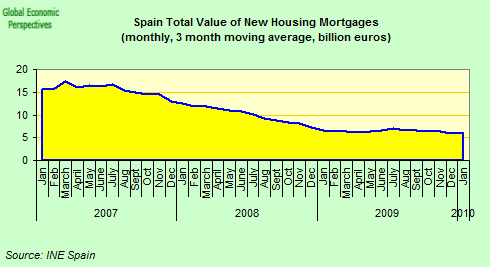 Just how are all these people going to continue to pay all those mortgages? 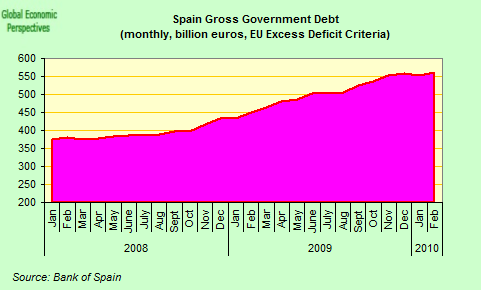 So it is not simply that "public sector borrowing is aggravating external debt and leading Spain towards high-risk territory". 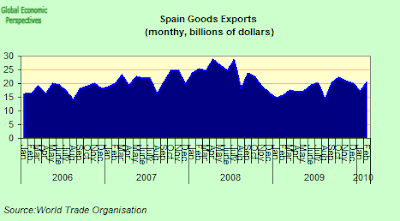 This is happening, as Spain's most high profile and most strategic export increasingly becomes government and bank paper, but this is the aggravating factor, and not the root cause. 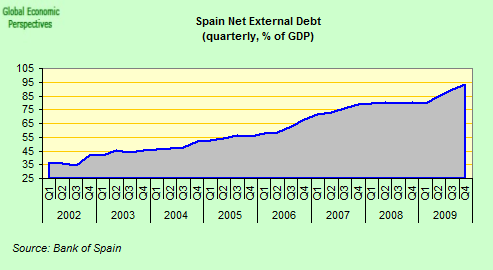 The principal reason why Spanish debt is steadily moving into high risk territory is the continuing state of denial to be found among the Spanish decision making elite, and the absence of any credible plan that is up to the magnitude of the challenge ahead. 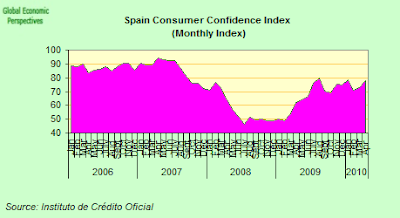 Confidence has now become the main problem, but not the confidence of those consumers who rationally decide to keep their money in the bank (to earn those very attractive 4 percent interest rates those banks who now anticipate having difficulty funding themselves in the wholesale money markets are offering) rather than going out and spending it. 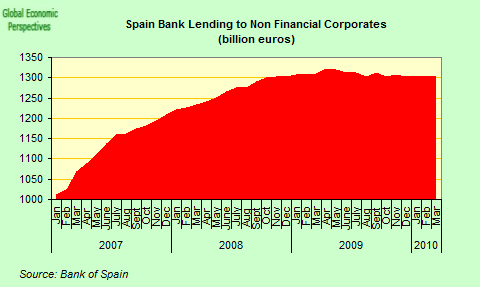 The real issue is to be found in the confidence (or lack of it) those who Spain and its banks owe money to that the country (as a whole and not just the government) is going to be able to pay it all back. And in this context the sea change in mentality that Victor Mallet describes - assuming it is maintained - will be crucial. Those of us with rather longer memories - ones that stretch back to January for example - may wonder whether, once the immediate pressure is off, all that new found national resolve may not simply drift back into the mists from which it emerged, as has happened only too often in the past. Maybe the simplest and quickest way to help everyone feel comfortable that this was not going to happen would be to call in the IMF now, not becuase a bailout loan is needed yet, but as David Cameron is suggesting in the UK case, to carry out a "no holes barred" policy audit, so that everything which should be transparent actually is. Of course the problems which became all too apparent on Wednesday went well beyond Spain. Along with the CDS prices, bond spreads widened all across the European periphery - with Spanish, Greek, Portuguese, Italian, and Irish yields all widening in tandem. Yields on Greece's two-year bonds briefly even hit an incredible 21%, following Standard & Poor's downgrade of the country's sovereign debt to junk status the day before. All of this and more finally forced the EU’s hand, and officials had to go rushing to the microphone to reassure investors that Greece would soon be able to access an aid package, with German Chancellor Angela Merkel going so far as to state that talks about providing aid should now be accelerated. Then the numbers started to be filtered out, and evidently they were much larger than many had been expecting. According to press reports IMF chief Dominique Strauss-Kahn told German policymakers that Greece might need EUR120-130bn over three years, a number which the German press quickly calculated would mean that the German contribution might then go up to EUR25bn. Certainly, at the point of writing we still don’t know what the exact number will be - and it is not even sure they have decided yet - but the reality is that once the EUR120-130bn number is out there from an authoritative source, it will be hard not to hit it, if not exceed it. Then followed the announcement that IMF staff have reached an agreement with the Greek authorities on a 3-year program that will include draconian fiscal cuts (of the order of 10pc of GDP) and a series of structural measures aimed at driving nominal wages lower, reforming the pension system and building better institutions. Thus, the message this weekend to investors is: stop worrying about Greece for the next three years; you can continue to speculate in the secondary market, but the Greek government will be fine. And debt restructuring with the private sector now seems to be off the table for, at least for as long as the Greek government stick with the conditions – which will obviously be the aspect to watch carefully going forward. And even if there is an eventual default, the main counterparty will be other European governments (and the taxpayers who back them) and not private bondholders. On the other hand, Europe’s institutions have, at a stroke, opened themselves up to a large slice of what is known as “moral hazard”, since the implicit message is : what we are doing for Greece we'll do for any other Euro-zone country, if needed. So from this moment on, we are all in up to our necks, if not beyond. Highly respected US economist and Harvard University Professor Martin Feldstein went even further, saying that in his opinion Greece will eventually default on its bonds and he feared other euro-area nations may follow, most probably Portugal. “Greece is going to default despite all the talk, despite the liquidity package,” he said. Portugal's name is mentioned frequently these days, since although the government deficit and debt levels are lower in Portugal than in Greece and the Portuguese government has much more fiscal credibility than its Greek counterpart, when you add private sector debt to the public part the number is not far short of 300% of GDP, and in fact the underlying problems are very similar to those which are to be found in Greece. But it isn’t only in the South the the EU has to worry, since probems in the East continue to fester. The Hungarian forint had a fairly hard time of it over the past few days, and had a two-day intraday loss 3.6 percent on Tuesday and Wednesday, its biggest such fall since March last year. At the same time the cost of credit default swaps on Hungarian debt rose 23.5 basis points to 240. The drop followed revelations from Hungary’s incoming Prime Minister Viktor Orban that the country’s underlying fiscal deficit had in fact been rather higher than the previous government had acknowledged. So contagion may now be also moving Eastwards, meaning that EU institutions may now increasingly face a battle on two fronts, since the wobbling won’t simply stop with Hungary, there is Latvia, Bulgaria and Romania to also think about (just to name the first three that come to mind).